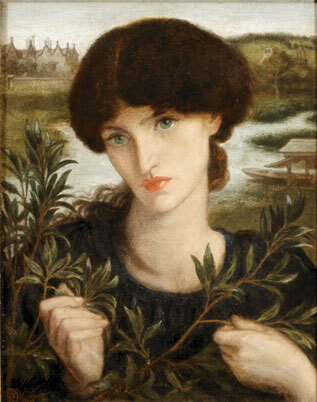 Dante Gabriel Rossetti (1828–1882), Water Willow, 1871. “Useful & Beautiful: The Transatlantic Arts of William Morris and the Pre-Raphaelites” will be the subject of a conference and related exhibitions to be held 7–9 October 2010 at the University of Delaware (Newark, DE) and at the Delaware Art Museum and the Winterthur Museum & Country Estate (Wilmington, DE). Organized with the assistance of the William Morris Society in the United States, “Useful & Beautiful” will highlight the strengths of the University of Delaware’s rare books, art, and manuscripts collections; Winterthur’s important holdings in American decorative arts; and the Delaware Art Museum’s superlative Pre-Raphaelite collection (the largest outside Britain). All events will focus on the multitude of transatlantic exchanges that involved Morris, the Pre-Raphaelites, and the Arts and Crafts and Aesthetic movements of the late nineteenth century. In addition to sessions featuring internationally known scholars and experts, there will be a keynote lecture by noted biographer, Fred Kaplan; demonstrations by leading practitioners who make and design Arts and Crafts objects; special exhibitions; an early music recital; and a performance of Oscar Wilde’s The Importance of Being Earnest by the University of Delaware’s critically acclaimed Resident Ensemble Players/Professional Theatre Training Program. Fred Kaplan, the noted biographer and Distinguished Professor Emeritus of English at Queens College and the Graduate Center of the City University of New York, will give the conference keynote address on Thursday, 7 October. Kaplan is the author of many books, including The Singular Mark Twain; Gore Vidal; Henry James: The Imagination of Genius; Dickens: A Biography; Thomas Carlyle (finalist for the National Book Critics Circle Award and the Pulitzer Prize); and, most recently, Lincoln: The Biography of a Writer. His lecture, on “Useful and Beautiful: Henry James and Mark Twain,” is sponsored by the University of Delaware Library Associates and associated with the exhibition, London Bound: American Writers in Britain, 1870–1916, at the University of Delaware Library. In conjunction with the “Useful and Beautiful” conference Special Collections at the University of Delaware Library has installed The Kelmscott Chaucer, an exhibition in the Library Information Room exhibit case adjacent to the Internet user area. On display is the Library’s copy of the most celebrated book from William Morris’s Kelmscott Press. The book will remain on display until 5 p.m., Friday, 8 October. The Works of Geoffrey Chaucer. [Hammersmith: Kelmscott Press, 1896]. William Morris (1834–1896), poet, social reformer, and a leading figure in the Pre-Raphaelite movement, founded the Kelmscott Press in 1891. Named for the Kelmscott Manor House, about thirty miles from Oxford, where he lived, the Kelmscott Press issued a total of 65 volumes between the years 1891 and 1898. Deeply influenced by the beauty and quality of fifteenth-century books, Morris emulated them at the Kelmscott Press. His greatest achievement was The Works of Geoffrey Chaucer, printed in 1896 and limited to 425 copies. The Kelmscott Chaucer was printed in two columns on handmade paper with specially designed large gothic type in red and black, with 87 woodcut illustrations and 116 full-page plates after designs by Sir Edward Burne-Jones, and numerous woodcut borders and initial letters designed for this work by William Morris. William Morris was particularly concerned that his books be conceived as a total unity so that the paper, ink, type and decorative motifs had a uniform and complementary style. William Morris’s work had an enormous and beneficial effect on the printers of his time. He led the way back to using unified typography, and he reinstated the book illustrated by one artist and conforming to an overall design. His passion for perfect craftsmanship, his attention to detail, and his success in focusing attention on the craft of printing are his most enduring legacies. The Kelmscott Chaucer is an outstanding example of nineteenth-century book production and one of the most lavishly decorated typographic works of the post-medieval era. The University of Delaware Library and the Delaware Art Museum invite applications for the 2011 joint Fellowship in Pre-Raphaelite Studies. This one-month Fellowship is intended for scholars working on the Pre-Raphaelites and their associates. Up to $2,500 is available. The recipient will be expected to be in residence during 2011 and to make use of the resources of both the University of Delaware Library and the Delaware Art Museum. By arrangement with the Yale Center for British Art, New Haven, CT, scholars may apply to each institution for awards in the same year; every effort will be made to offer consecutive dates. The Delaware Art Museum is home to the most important collection of Pre-Raphaelite art in the US. Assembled largely by Samuel Bancroft, Jr., the collection includes paintings, works on paper, decorative arts, manuscripts, and letters, and is augmented by the museum’s Helen Farr Sloan art library. With comprehensive holdings in books, periodicals, electronic resources, and microforms, the University of Delaware Library is a major resource for the study of literature and art. The Special Collections Department contains material related to the Pre-Raphaelites who are also well-represented in the Mark Samuels Lasner Collection of Victorian books, manuscripts, and artworks. The deadline for applications is October 15, 2010. For more information and an application form visit www.delart.org/education/fellowships.html or write to: Pre-Raphaelite Studies Fellowship Committee Delaware Art Museum, 2301 Kentmere Parkway, Wilmington, DE 19806. In a welcome addition to “Useful & Beautiful” a selection of Aesthetic movement women’s fashion from the University of Delaware&rsquio;s Historic Costume & Textiles Coillection will be on display during the conference. This exhibition, on the second floor of Alison Hall West, runs from 4 October to 17 December 2010.